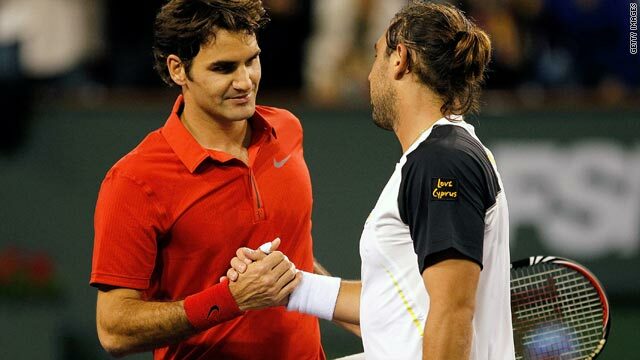 Baghdatis (right) saved three match points before turning the match around against world number one Federer. World number one Roger Federer has crashed out of the Masters 1000 tournament at Indian Wells despite holding three match points against his Cypriot opponent Marcos Baghdatis. The Tuesday night match in California proved a two hours 22 minutes classic with 27th-seeded Baghdatis trailing by a set and then saving the first two match points at 4-5 down in the second set on his own service. The 24-year-old saved both and then broke the Swiss maestro in the next game before serving out for the second set. Baghdatis, who reached the Australian Open final in 2008 losing to Novak Djokovic, also trailed 4-1 in the deciding set and after breaking back faced his third and final match point at 6-5, but Federer netted a backhand to see his chances disappear. Baghdatis took advantage and secured a mini-break in the tiebreaker which he claimed 7-4 to wrap up a 5-7 7-5 7-6 victory to reach the last 16 of the prestigious $4.5 million hard court tournament. "It was the best win of my career," Baghdatis told the official ATP Tour Web site. "I think that says everything. I cannot say I'm not happy." Australian Open champion Federer, who had struggled to beat Romanian Victor Hanescu in his opening match after his layoff, said his lack of match practice had counted against him on the crucial points. "It was a decent match, but maybe the wrong choices at the wrong time for me. That's not something you can really work on. That comes from playing matches and that's what I need." With Federer out, the path on their side of the draw appears clear for Britain's Andy Murray, who eased past Michael Russell of the United States 6-3 7-5 in their third round match. Fourth seed Murray was beaten by Federer in the final of the opening grand slam of the season in Melbourne. Home hopes were boosted by an easy straight sets win for seventh seed Andy Roddick over Thiemo de Bakker of the Netherlands while in-form Jo-Wilfried Tsonga of France was taken to three sets before beating Albert Montanes of Spain, 4-6 6-3 6-3.